Last November I travelled to Kathmandu, Nepal for the first time, at the invitation of Yosi Tal of Designer Rugs, to meet the weavers of our first and second collection of rugs, which will be launched next year. I will keep the new range under wraps for now, but it was exciting to see them being woven and to witness the many and varied processes required to produce hand-knotted rugs. Kathmandu post the April 2015 earthquake that killed approximately 10,000 people, is in the post-disaster/reconstruction stage and the scars are still very visible, with infrastructure stretched to the limit. Many survivors flocked to the city from towns and villages devastated by the earthquake, drastically increasing the population and adding to the pollution and general chaos. There is, however, unexpected beauty and hidden surprises amongst the mayhem. A beautiful garden near the old part of Kathmandu called the Garden of Dreams is surrounded by traffic and dust, forming an oasis of calm. I went to a farmers market selling organic fruit and vegetable, lattes, a huge variety of cheeses and French pastries, it could have been in Sydney! 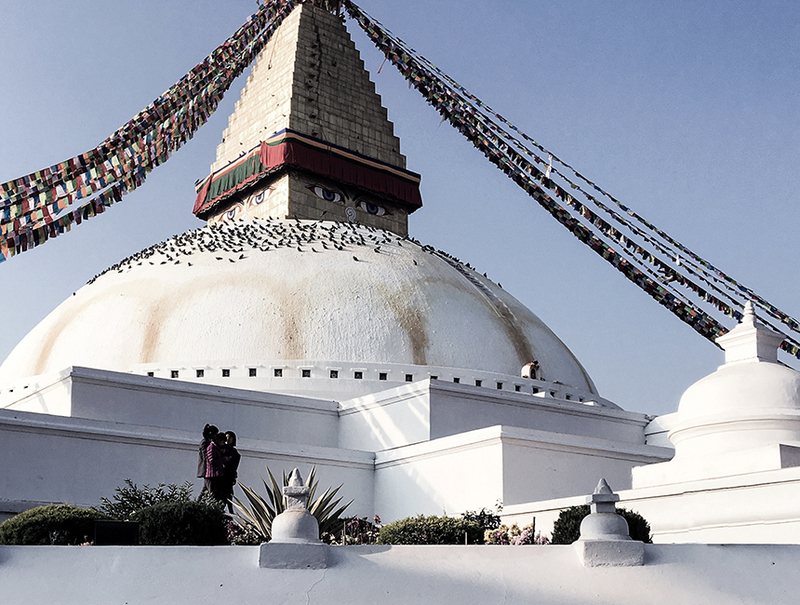 The gentle and hospitable nature of the Nepalese, in spite of everything, is remarkable. Although many ancient buildings, temples and Buddhist stupas were damaged, there are still many left intact or in the process of repair, often inexplicably next to each other. Next to one of the weaving workshops we visited was a ‘display home’ constructed as a post-earthquake temporary shelter solution for survivors whose homes were destroyed. It was made out of 14,000 plastic water bottles, each filled with clear or coloured water to give them strength, bound together using clay, and constructed within a framework of bamboo. It was such an inventive and elegant solution to the problem and by using biodegradable materials with discarded bottles – a way of improving the environment. Standing inside the house reminded me, in a strange way, of Sainte-Chapelle Cathedral in Paris, which has 600square metres of stained glass in the upper chapel, and is a magical place to stand, bathed by coloured light. The project is spearheaded by PET Bottle World, a not-for-profit organisation who have already collected over 1,000,000 discarded PET bottles, and utilising teams consisting of architects and designers in collaboration with locals, have built over 200 houses in Kathmandu and surrounding villages. I was lucky to share this and many other wonderful experiences with Johnathon Murray and Christine McDonald of Designer Rugs, who were delightful and enthusiastic travel companions. We were all enriched by the experience.